Dr. José D. Jiménez has been caring for the children, teenagers, and young adults of Wesley Chapel for over 15 years, after opening his doors in November, 2003. 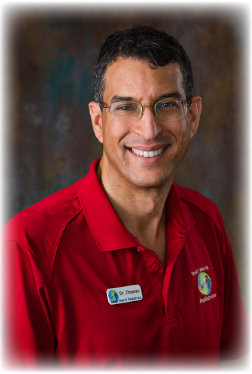 He has lived in the Tampa Bay area for 20 years, completing his medical school and residency training at the University of South Florida and is currently the President of the Hillsborough County Medical Association. Small World Pediatrics first opened at the Northwoods Plaza near the Super Target on Bruce B. Downs Blvd. The office moved to its present location within Windfair Professional Center in 2010 (across the street from Florida Hospital Wesley Chapel). 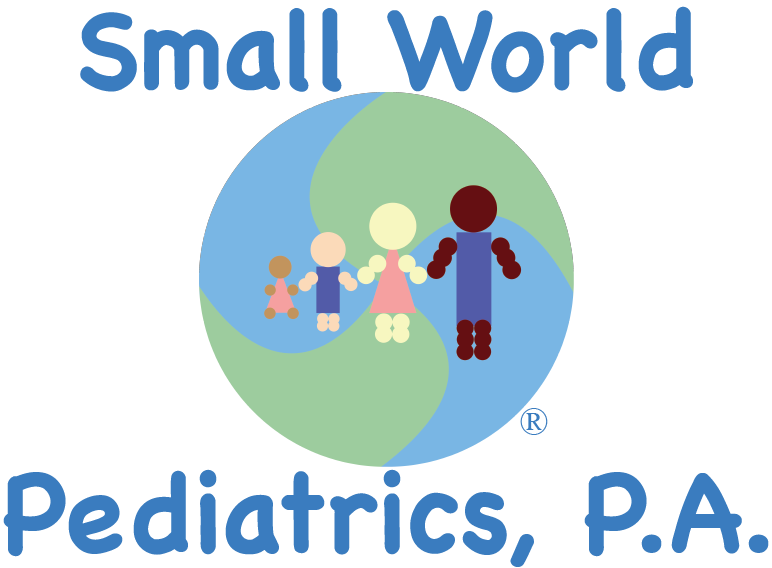 At Small World Pediatrics, you will find a friendly and warm atmosphere. We are here for our patients and you, the parent. You can be sure that our service is dedicated to the care of your child, and we strive to make your visit enjoyable, educational, and comforting. Each child is a special and unique individual, and we treat each one as such. Caring for children is our passion, and we strive to provide the best care for their physical and emotional well-being. We want children and parents to feel comfortable, and to remember their experience with their pediatrician as memorable and a meaningful part of their life. Dr. Jiménez has a passion for both his patients and his profession. It is this passion that has led him to get involved in advocacy on behalf of children, pediatrics, and medicine. Dr. Jiménez became involved with the Katie Marchetti Memorial Foundation in 2007. The main mission of the Foundation was to promote seatbelt use among teens through education. The Tampa Bay area has the highest teenage death rate from automobile accidents, and it was this group’s mission to pass a primary seat belt law to help protect teenagers from so many needless deaths. Dr. Jiménez has also served the State of Florida with his tenure on the Florida Medicaid Pharmaceutical and Therapeutics Committee (2008-2011). He was appointed for the position by Governor Charlie Crist, serving 2 years under Governor Crist and 1 year under Governor Scott. Dr. Jiménez and his wife have two children. They are involved in Boy Scouts and are parishioners of St. Mark’s Catholic Church. 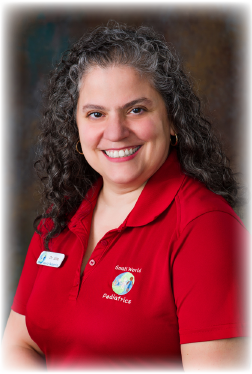 Dr. Nancy M. Silva is a Board Certified Pediatrician. She is a graduate of SUNY Health Science Center at Brooklyn (Downstate). She completed her Pediatric Residency at USF College of Medicine in Tampa, Florida where she trained at both All Children’s Hospital and Tampa General Hospital. Previous to joining SWP, she worked at HealthPoint Medical Group in Brandon for nearly 14 years. She is a member of the American Academy of Pediatrics, Florida Chapter of the American Academy of Pediatrics (FCAAP), the Hillsborough County Pediatric Society, American Medical Association, Florida Medical Association (FMA), and the Hillsborough County Medical Association. She served as Editor of the FCAAP’s Newsletter, The Florida Pediatrician for 6 years (2007-2013). Currently, she serves on the FMA’s Council on Ethical & Judicial Affairs and Parents Magazine Panel of AAP Moms. She has her own Pediatric Blog, DrSilvaTotsTweensAndTeens.com. She is active in the community as a Boy Scout Medical Officer, Leader, Chaplain & Committee member. She’s also involved in charitable organizations, such as St. Mark’s Catholic Church, Plant City Community Ministries and The Philanthropic Women of St. Joseph’s Hospital. She and Dr. Jimenez have been married for 17 years and have two children. Her interests include child advocacy, childhood vaccinations, music, photography, and scrapbooking. 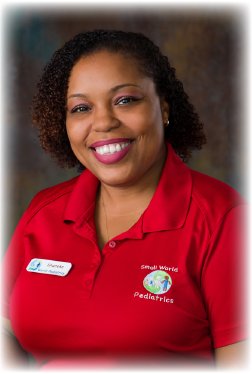 Shaneka is the Office Manager at Small World Pediatrics. She has been a part of Small World Pediatrics since 2015. Shaneka is also furthering her education at Keiser University. She enjoys watching the TV series Law & Order and cartoons.